JerkStoppers Not Quite As Elegant As MagSafe | OhGizmo! While Apple’s MagSafe connector is designed to easily break away should something tug on your laptop’s power cord, the JerkStoppers seem to do the exact opposite. They’re designed more as a ‘cable retention device’ to prevent your laptop’s power cable from being damaged should anyone or anything pull on it. To accomplish this you simply run your power cable through one of the JerkStoppers, which then connect to an unused RJ11, RJ45 and in a pinch, USB port. The ports basically anchor the JerkStoppers, so that any tugging or pulling doesn’t put pressure where the power connects to the laptop. 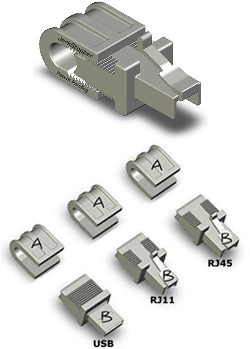 Obviously the locking nature of an RJ11 or RJ45 port are the better option, but the friction lock mechanism of a USB port should work almost as well. The JerkStops are available from Damage Control Products LLC in sets of 3 for just $9.95. Personally, I’d rather my laptop’s power be unplugged than potentially pulled off of the table it’s sitting on. It doesn’t take much to get my lappy flying, and sometimes my dog snagging the cable will get it going even without a device like this impeding it from getting unplugged. This is far too dangerous for the laptop. Cheap and dumb product if you ask me. weird weird idea .. so what’s better, getting your power tugged out, or your network port ripped off its solder joints? and won’t help solve problems with laptops flying when they get tugged …. In more than years testing we haven’t had a network or modem port “ripped off” or even damaged. Look at the way the interface was designed and you’d see why. . .
Actually the device was designed to keep the day-to-day tugging and pulling and jerking on the cable from damaging the power pin in the laptop. Nothing can help your laptop if you jerk it off the table or drop kick it across the room. re; MagSafe. . . . Anonymous. . . . A. it’s not dangerous and B. a surprising number of MagSafe endowed computers are equipped with a JerkStopper including Leo LaPorte (The Tech Guy). I guess the intended purpose doesn't include curing terminal stupidity.